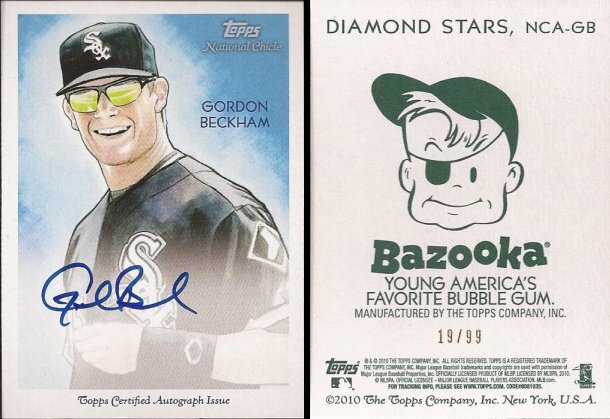 One of the great parts of card collecting in recent years is adding in relics (real or not - but hopefully mostly real) and autographs. Back when I first started in the 70's, and then when I got back in during junk wax, these were nothing you could find. I remember when Upper Deck first added autograph cards in the early 90's. Always wanted to pull one but it just never materialized. Now we have short prints, relics, serial, autographs, refractors.... I could keep going, it's great when you pull something cool. Usually, I pull a high production serial or a relic. So most of the autographs in my collection have come from trades or purchases. There are a few current White Sox players autographs I have wanted. I was getting to that, Victoria. So I have been trying to score an autograph card from this player for many months but I seem to get sniped each time I go after what I want. Posh - knock it off. Anyway, as I was saying, I would search for cards of this player and someone would swoop it and snag it from me seconds before the end, or the price of the card just got way above what I wanted to pay. HOLY CRAP, DAVID!! Would you reign in this wife of yours?! This is my forum and I will be the one talking here about finally obtaining a long time want. I'll tell you what you want, what you really, really want. Serialed #19/99. And today is the 19th. Go figure. Gordon Beckham - check! Nice! I'm jealous. I really like Beckham, I keep hoping for his bat to pick up. I'm afraid Kenny is going to get rid of him after his last couple of subpar seasons. In front of the midfielders there are forwards and centers. The main difference between these two is that a forward normally has good sprinting abilities while centers are stronger and better target players.